Dr. Franken Stein (Franken being his first name) is the man that changed Sid into a zombie. He was also Death Scythe’s first partner (Maka's mother was the second). He was also the most powerful technician to ever graduate from the school, Shibusen. He has a bolt going through his head which turns so his thoughts would be on the matter at hand. He mostly moves by pushing his chair in the direction he wants to go even if it ends up with him crashed on the floor. Stein is such a strong fighter that he could take down Black Star while still seated in his chair. 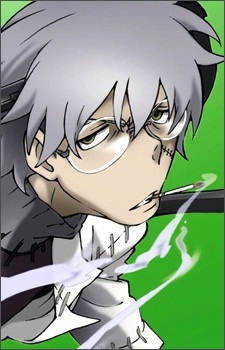 Stein sees everything in the world, including himself, as an experiment or specimen. He even experimented on Spirit (now Death Scythe) when he was sleeping during the five years they worked together. His understanding of soul wavelengths gives him a huge advantage against other users since he can change his own to match the other’s wavelength and thereby nullify or disrupt the soul frequency of the technician and weapon. This comes from his high spiritual flexibility and by observing his opponent beforehand. His soul wavelength is so high that he doesn’t need a weapon and can channel it through his body and release it out of his body as electric discharge. He has a strange hobby of wanting to dissect anything he thinks is interesting. He is also the school doctor; he still respects Spirit and still calls him Senpai. Other than his electric charges, he uses a repertoire of other techniques such as Soul Sutures, a technique which binds people to e.g. the ground via a soul wavelength (the technique is costly, it requires so much attention the wielder cannot move), Witch Hunter (the technique Maka uses) when he is using Spirit as a weapon, and the ability to cancel out direct soul attacks by matching wavelengths (explained earlier). He goes crazy after the Kishin is released and madness wavelengths overwhelm him. Medusa takes advantage of this and takes him under her wing. Marie saves him, by using her healing wavelength.